I’ve recently been pondering the thought of lightening my hair. I have no idea what color but the black is getting old and I want something new and fresh for the summer. Lemon oil is pressed from the skin of the common lemon fruit, Citrus limon. Natural beauty author Dina Falconi recommends it for use in hair-lightening shampoos and rinses. Lemon essential oil also pulls double-duty as a grease-fighter for people with oily hair. If you have dry or damaged hair, lemon oil may be overly drying. Citrus oils can make skin more sensitive to sunlight, so avoid getting lemon oil on your exposed scalp or hairline. Grapefruit oil carries many of the same pros and cons as lemon oil. Like lemon oil, grapefruit oil comes from the pressed skin of a citrus fruit, in this case the common grapefruit, Citrus paradise. And like lemon oil, grapefruit oil can be over-drying for some hair types. It also also puts you at risk of phototoxic exposure if not used carefully. On the bright side, grapefruit oil lightens hair and puts oily glands in their place. Along with those charms, most people find grapefruit essential oil’s aroma uplifting and energizing – a great attribute for the morning shower. Falconi recommends combining grapefruit and lemon oils in hair-lightening shampoos, rinses and oil treatments..
Chamomile’s tradition of lightening blonde hair goes back centuries, when women infused the daisy-like flower’s fresh or dried petals to make a lightening rinse. Of the chamomile oils produced today, Roman chamomile is best suited for hair products. Roman chamomile oil is distilled from the flowers of the perennial chamomile plant Arthemis nobilis. Because it lightens without drying or over-moisturizing hair, Roman chamomile oil is a good choice for people of all hair types. I will most definitely be incorporating these oils into my regimen to see what kind of results I will get before going the permanent route of coloring my hair. Add lemon, grapefruit or chamomile essential oils directly to your favorite mild shampoo at a rate of about 30 to 40 drops for every 8 ounces of shampoo. Or place one or two drops of one of these brightening essential oils onto your hairbrush before brushing your hair from scalp to ends. Never put the oil in your hands first, because the highly concentrated oils can irritate exposed skin. You may also add two to three drops of essential oils to 2 cups of water or cooled chamomile tea. Use this infused water to rinse hair after shampooing. Finally, consider adding a few drops of lemon, grapefruit or chamomile oil to a hot oil treatment. What do you think beauties? 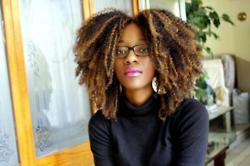 Will you try some of these oils for lightening your natural hair? Sound off below! I was just thinking about lightening my hair today. 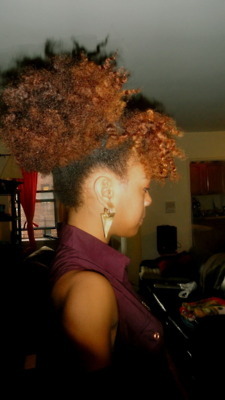 I am wishing for the honey colored hair of my TWA days but I know the bleach and the henna wont mix. So this was right on time-I think I am going to try it! I have tried honey and chamomile tea with more chamomile essential oil, then of course sun it while it's wet – aside from going to the beach- this technique works best! best shampoo for oily hair. In market various shampoo are available for oily hair but which shampoo is best for oily hair? I have oily hair, so what kind of shampoo to use for my hair or what is the best shampoo for oily hair ???? If anyone want to keep her him hair is natural and black he or she can use this oil .Its work very well for hair. Your post is very nice. I like it. I got many valuable information's. I am very much fond of articles related to essential oils.Thank you for your nice shearing. i have oily< and curly hair…how possible rid of curly hair and what to d0….